I am prompted to write this by a comment I read in a newspaper asking why, if we criticize mainstream Muslims for not denouncing the extremists among them, do mainstream Christians not call out their evangelical colleagues for supporting Donald Trump? It is a good question. And the only proper answer is that we should do so. Fortunately there are exceptions, with some evangelicals breaking the traditional ranks, yet on the whole the evangelical movement still seems devoted to the Republican candidate no matter who he is. Is not ashamed to tell one lie after another, whether it’s about his support for the Iraq war, his business record, his treatment of women, or the purported extent of voter fraud in America. Trump’s catalogue of lies is so extensive that one only needs to google it and it will keep one reading for weeks. “Hillary Clinton isn’t trustworthy so I’m voting for Donald Trump”: how does the irony of such a statement escape so many people? Plays on fear and intimidation to gain support, and implies that most undocumented immigrants are violent criminals who are taking over the country, when in fact many are fleeing violence and intolerable conditions in their own countries and have made positive contributions to our society. Uses this fear to divide people and encourage us to hate each other: if your life is a mess, then you must be the victim of some dangerous group like immigrants or Muslims. Shows contempt for women practically every day, judges them by how they look, brags about sexually abusing them, and then tries to humiliate them when they protest. Lies about his opponent’s record and then like a petty dictator threatens to put her in jail if he wins. Encourages his followers not to accept the election result if he loses and to patrol polling places intimidating suspected fraudulent voters (read: minorities). Is so thin-skinned he spends day after day attacking anyone he feels personally slighted him, yet thinks he is prepared to face the inevitable provocations of our international adversaries. Donald Trump is also running as head of the Republican Party, which in recent years has not only become extremist but obstructionist, refusing to compromise on anything (including the Supreme Court and much needed gun regulation and just about anything else a Democratic President might propose), and threatening to shut down the government for reasons as trivial as a refusal to defund Planned Parenthood. This is a party proclaiming “fiscal responsibility,” but whose policies of cutting taxes for corporations and the wealthy would add mightily to the deficit. It is a party whose unashamed promotion of the proliferation of firearms of all types without restriction would make the entire nation more dangerous than the old Wild West. When was the last time an untrained “good guy with a gun” ever stopped a mass shooting? What happens far more frequently is that common disputes arising when people get annoyed with each other - as people increasingly do these days - are more likely to end with someone seriously or fatally hurt. What makes America’s gun fatality rate many times that of other developed countries is the ready availability of guns in the hands of people without the emotional maturity to use them. Even if one locality has strict gun laws, those laws are undermined by the laxity of gun regulation in many other places. One of the most dishonest and disgusting arguments that gun lobby supporters make is that cities with strong gun laws still have a high incidence of gun violence. A new report by the New York State Attorney General has found that while New York has some of the strictest gun laws in the country, the vast majority of guns used in crimes in the state come from other states where gun laws are weak. The problem of gun regulation can only be solved on the national level. This brings us to the greatest irony of all: the people of religion who support a candidate who espouses such values call themselves “pro-life.” There is no greater hypocrisy imaginable: “pro-life” people, many waving Christ like a banner, promoting policies resulting in mass deaths. Yes, there can be serious gun regulation without gun elimination. Enforce background checks, require licensing and training, demonstrate a legitimate need to own a gun, and outlaw firearms that no ordinary citizen needs such as military-grade weapons specifically designed to kill large numbers of people. But these “pro-lifers” refuse to make even the most reasonable compromises and must have the full array of their lethal toys available to them at any human cost, because it is their individual “right” and as far as they are concerned the desires of the individual “trump” the needs of society. So what about “pro-life”? Is the abortion issue enough reason to support a candidate for President so clearly irresponsible and unqualified? To those who equate abortion with murder: If that is what you really believe, then be consistent and start calling for murder charges and life imprisonment for women who have had abortions. Hopefully you have enough decency to see the inhumanity of such a proposal. But if you do not espouse it, then drop the incendiary rhetoric of “murdering babies” because clearly you are not equating abortion with murder. The supposed rights of the “unborn” are no justification for giving the most important job in the world to an individual with such little respect for women and minorities, such little respect for our democratic process that he encourages people not to accept the results of a legitimate election, such little knowledge of other countries, and such an inflated sense of himself (“Only I can fix it”) that he would be truly dangerous both domestically and internationally. So a special shame on those who support this man in the name of their Christianity. You cannot support his values and call yourself a Christian. 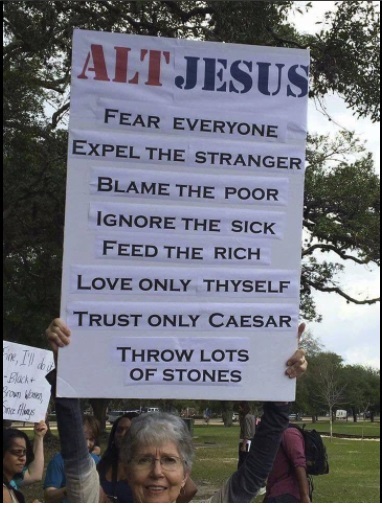 Jesus called us to care for the poor, not rob from them. Jesus called us to love foreigners, not to hate and fear them. Christians would be better off taking orders from Christ rather than from demagogues. Hillary Clinton was wrong to call Trump’s supporters “deplorable.” Many of them are decent human beings who somehow believe Trump cares about the “little guy” even though his record shows completely otherwise, even to the point of trying to evict an old lady because she lived where he wanted to build. We should not attack people; let’s leave that to Trump. Nevertheless, the act of supporting and voting for this man is deplorable. That is not a prejudicial statement; it is an obvious one. It is hard to see how this country can run on the values described above and survive. Yet many who call themselves the “Moral Majority” and “Values Voters” have embraced this man. It is time to be honest about those “values.” It is time to drop the false piety and hypocrisy.